Sheet Pan Chipotle Chicken with Corn Salsa is absolutely bursting with sweet and spicy flavors, and it will totally wow your guests! This is the perfect dinner for a busy weeknight or a fancy dinner party. Amazon affiliate links are for your convenience. As an Amazon Associate I earn from qualifying purchases at no additional cost to you. Sheet Pan Chipotle Chicken with Corn Salsa is one of my favorite dinners that my whole family loves, and from start to finish, I can get it on the table within thirty minutes. And get this . . . it’s lovely enough, and certainly delicious enough, for a fancy dinner party, too! Let’s break it down . . . . The sheet pan. After the salsa and chipotle butter are made, it’s all put together with boneless, skinless chicken breasts on a sheet pan and baked for ten minutes. The chicken cooks during this time, but just as important, all of the flavors meld together. And there’s only one pan to bring to the table — oh, and a side of sliced avocado, which is so good with this! The chipotle. A chipotle butter is made with chipotles in adobo sauce, cumin, lemon juice, butter and olive oil. This is spread under and over the chicken breasts on the sheet pan before it goes in the oven. The corn salsa. This is made with fresh corn, lime juice, tomatoes, cilantro, red onion and a touch of cayenne pepper. (I like to mix yellow and white corn.) The salsa is spread around the chicken on the sheet pan and absorbs some of the chipotle butter. Since it only cooks for about ten minutes, the corn keeps its crunch. Delicious! I always serve this with sliced avocados. That, with the chicken and corn salsa is enough — however, if you want to add more variety to your meal, a rice dish and/or a salad would be great with this. Coconut Cilantro Rice is a perfect choice. Sheet Pan Chipotle Chicken with Corn Salsa is absolutely bursting with sweet and spicy flavors, and it will totally wow your guests! Wash and dry the corn. Then use a chef's knife to remove the kernels and add them to a medium-sized mixing bowl. Add the tomato, onion, cilantro, cumin, lime juice, salt and cayenne. Set aside. Spread a thin layer of the chipotle butter on the parchment-lined sheet pan, and place the chicken breasts on top. Divide the remaining chipotle butter among each one, spreading it evenly on top. Now add the corn salsa to the sheet pan, around and between the chicken. Bake in the preheated 375°F oven just until the chicken is cooked through, about 10 minutes. If you want to shave a few minutes off the prep time, you can use frozen, thawed corn. Yummy I am all over this! Oh, Valentina, this looks ridiculously good! If I did not promise my girls hamburgers, I would have definitely made your dish (bought some gorgeous corn at Trader Joe’s). Valentina, I’m loving this dish as it’s taking me back to my Tex-Mex roots and making me hungry. An absolute must make. I can’t get Chipotle peppers in Adobo sauce here but I can get dried Chipotle peppers. Do you think I could reconstitute those and make the sauce? Hi Ron, Yes, you could definitely do that. Here’s a recipe I found that tells you exactly how to do it. 🙂 Enjoy and thanks! Thanks for the link, Valentina. Not exactly a fan of corn, but that chipotle chicken looks seriously delicious and healthy! Mmmm, chipotle. Love the flavor of this — makes any dish better just by being included. This is such a terrific looking dish — loads of flavor (how can it not be with chipotle?!) and easy. Easy is good. 🙂 Thanks! This dish looks absolutely mouthwatering, Valentina! The chicken looks so juicy! Oh yum! Valentina, this chicken has all my favorite flavors in it! And it’s so easy! Love a quick sheet pan dinner! You had my attention at 30 minutes or less! My family would love this recipe, that spicy chipotle draws them in every time. I agree, Deb. Chipotle always a crowd. 🙂 Thank you! Living in Australia, cooking with chipotles et al is not an everyday affair with us either 🙂 ! However much I do not like cooking with premade products this is easily available – even at the local supermarkets.Your dish looks very easy, fast and tasty . . . shall try as soon as able. If one ends up with a dozen to feed ad hoc over a weekend these sheet dishes I have known since childhood surely fit the bill 🙂 ! I just made a new batch of “David-safe” chipotles in adobo so I can’t wait to use it for this recipe. Just the chipotle butter alone on a grilled steak or chicken breast would be amazing! It would be amazing on steak! Love that idea. Thanks, David. Hope you’re having a great weekend! We have never combine these ingredients but they promise to be soooo good. Definitely to do ! Thank you so much. Sharing ! Thanks so much. They are so delicious together. Hope you love it! We entertain friends several times a month and this sounds like the perfect dish to serve. I can have it all assembled ahead of time and put it in the oven while we have a cocktail. I’ve pinned, it will be on our dinner table soon. Yes, Karen, exactly. It’s a great, easy dish for entertaining. Enjoy and thank you! I hear ya on those involved recipes, Valentina! I love involved recipes, but I just haven’t had the time lately to play in the kitchen as much as I would like. I blame the move…and a certain 3-year old. 🙂 Recipes that are both quick and easy but still elegant definitely rank high on my list. I love the concept of chipotle butter here. What a great (and unique) way to bring flavor to this dinner! Love this dish! The chipotle butter sounds amazing, I just love the ones in adobo sauce like you use. Looks like this is a winner especially for a weeknight meal. Where to begin? With the chicken, I guess. How fantastic and off the beaten path. I can’t have enough corn, that’s for sure, and avocado – love them both. And I love chicken breasts, so this recipe is for me. Then, the video: I feel like I’ve met you! Very cool. 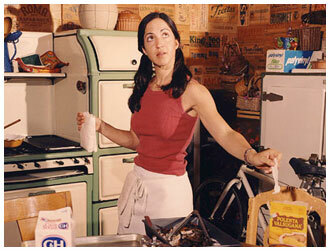 I love that stove behind you! I want one! Like you, I also cooked with someone – my grandmother, who was a Polish immigrant. And she, as you say, never measured anything. I love that I learned to do that with her – going by feel and by instinct. But like you, I’ve also painstakingly measured out many of her recipes. Thank you so much, Jeff! 🙂 Hope you love the chicken as much as I do. And I so appreciate the video compliment. Not exactly my comfort zone. So cool you got to cook with your grandmother. I love that. I find it so liberating when I do just make up a recipe that doesn’t need note taking. Don’t you? Though it is great to be able to repeat things, too. Cheers and thank you again. Sounds and looks like a fantastic dinner, Valentina! Looks impressive, too 🙂 LOVE your introductory video! I bet your mom is beaming from above!